ACES Award of Merit Luncheon - Register by Noon Tuesday! The College of ACES Alumni Association is pleased to announce the 2014 ACES Award of Merit winners. 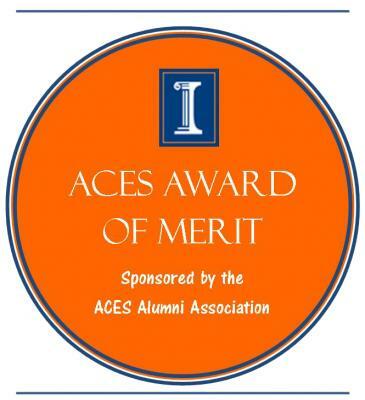 The College of ACES will honor the recipients of the Paul A. Funk Recognition Award, ACES Alumni Association Award of Merit, and College of ACES Faculty and Staff Awards on April 14, 2014 at the Pear Tree Estates in Champaign, IL. To view the award recipients visit the Funk Awards Website. 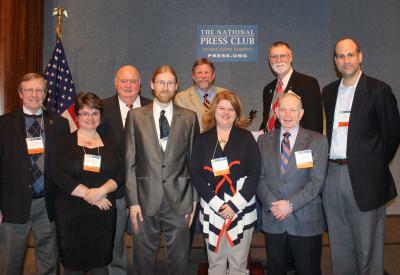 Despite the snow emergency, Big 10 alumni gathered in Washington DC in March 2014. This event drew alumni and friends from the University of Illinois, University of Minnesota, University of Nebraska, University of Wisconsin - Madison, The Ohio State University, Penn State University, Michigan State University, Purdue University, Rutgers University and University of Maryland. A great evening of networking with alumni and friends! Many thanks to all who joined us and ventured out! The College of ACES Student Advancement Committee (SAC) has launched an exciting new student philanthropy initiative to raise awareness among students about the role of private philanthropy in their student experience. On April 1, SAC launched the "I Pay It Forward: ACES Students Helping Students" campaign. For every student and donor that gives any amount, we are hanging "ACES Bucks" around the Atrium of the ACES Library to recognize all donors. We are proud to say we have over 500 students and alumni that have donated to this campaign so far! All of these gifts will be combined and used to award at least one new scholarship (maybe more depending on final totals) to a College of ACES student(s). Interested in helping students meet their goal? 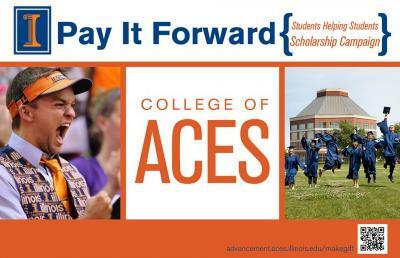 Visit the College of ACES Advancement website and select the "I Pay It Forward: Students Helping Students Scholarship Campaign" from the drop down menu. In honor of SAC's 25th Anniversary, we also will be hosting Phone A Thon for all SAC Alumni to help donate to the cause! It's time to celebrate! We are pleased to invite you and your family to a complimentary reception at Memorial Stadium's Colonnades Club. The ACES Alumni Association along with the ACES administrators, faculty and staff will be on hand to congratulate the College of ACES graduates and their families as well as welcome them to the ACES Alumni Association! 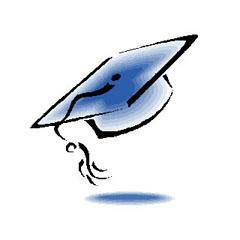 Graduates, please wear your cap and gown. Great photo opportunities await you at Memorial Stadium! Premiere access to the columns and field view will be moments you won't want to miss! . In just a few short weeks we will be welcoming a new group of ACES Alumni to the Alumni Association! With the State Farm Center (Assembly Hall) under construction the College of ACES will host two ceremonies and the ACES Tassel Turn reception. Tickets are required for the two ceremonies. The ACES Family University is being organized by the College of ACES Alumni Association and will be a self-supporting program that will rely on registration fees. You will have an opportunity to volunteer and be involved!